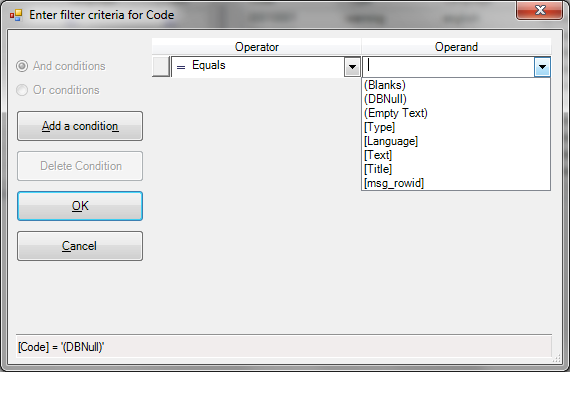 Can you customise the operands in CustomRowFiltersDialog? When using the UltraGrid's CustomRowFiltersDialog, is there a way to remove the default operands like Blanks, NonBlanks, etc. when adding a filter condition? We use external filtering and sorting and these values don't work well with our code. I can trap for them and clear the filter condition but I would prefer if users didn't have those options. Yes, there are a couple of ways you could do this. In your case, I think the simplest way would be to use the FilterOperandDropDownItems property on the override.It's a flags enum, so you OR the values together. If you need finer control than that, then the other option would be to use the events of the grid such as BeforeRowFilterDropDown or BeforeRowFitlerDropDownPopulate and you can remove items from the pre-built list or populate the list yourself respectively. That seems to only affect the grid's column filter, not the custom filter dialog. Which approach is not working? I tried setting FilterOperandDropDownItems and it seems to be working just fine. If you are using the events, then try using AfterRowFilterDropDownPopulate, instead. I think that event works for both. Setting the FilterOperandDropDownItems property to Custom and Blanks works for the grid. But the custom filter dialog shows the default items.